This came up yesterday, and it’s a bit of a dog-bites-man story so we weren’t going to do a lot with it, until we saw the blowback to the Baton Rouge Advocate from it. The dog-bites-man bit here is pretty obvious – of course the Advocate was going to have an article trashing the numbers the St. George organizers put out as a representation of what the budget for the proposed city would look like. We’re not really even put out by that fact – the St. George budget numbers are arguable as a matter of fact, for lots of reasons. Chief among them is that we have no idea who would run St. George or what that leadership group’s governing strategy would look like. We can expect it’s likely they’d be a lot of small-government types who’d look to contract out a lot of the city’s services, which we think is the future of municipal governance as legacy costs (pensions, etc.) mount and bankrupt a large number of the country’s local governments, and we can see how those numbers might look like the ones the St. George folks would have put together in their study released this week. But we really have no way to judge. St. George is just an idea at this point. There are no details, nor should there be. Signing the St. George petition doesn’t commit anybody to a vision of government, nor should it. Those decisions come later. 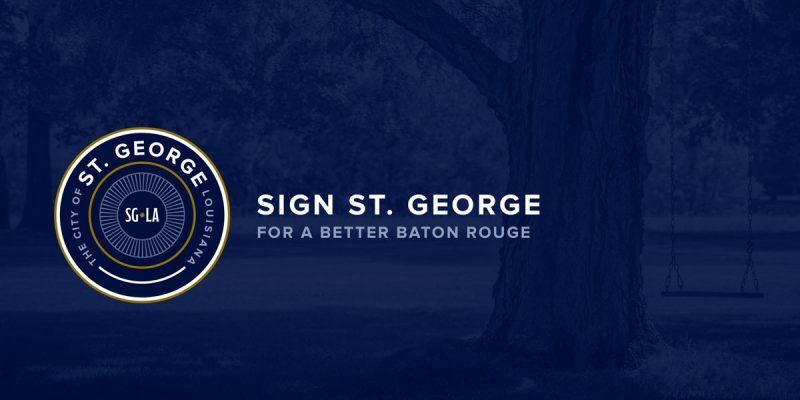 What St. George offers is the chance for folks in the southern part of East Baton Rouge Parish to have their own city and be governed closer to home; how that actually looks is for later, when it’s time to vote on a plan of government and a mayor and city council. That’s why St. George’s mock budget didn’t really interest us all that much. Critics of St. George have criticized movement organizers for lowballing the expense of incorporation and the bureaucracy they would need to create. Supporters have touted their new budget, saying it shows they won’t need to raise taxes. David Barrow, the former chief administrative officer for Central, which incorporated in 2005, reviewed the proposed budget. He questioned using the population figure for estimating certain revenues and expenses, saying in some cases it would make more sense to use other data to make the calculations. For example, East Baton Rouge city-parish government spent $11.7 million on its department of transportation and drainage in 2016. St. George has budgeted spending $2.24 million — or 19.2 percent of what the city-parish spent — on transportation and drainage. Rebowe said St. George could create its own department to handle transportation and drainage, hire a private company to do it, or work out a deal for the city-parish to keep providing the service. Calculations for the other sources of revenue — including occupational license taxes, licenses and permits — for St. George may have had some errors because of the usage of population figures, Barrow said. St. George’s budget says they can expect more than $2 million from occupational license tax collections because it’s 19 percent of the collections in East Baton Rouge Parish. Barrow said those collections, though, should be based on the number of businesses in an area and not on population. And Barrow said St. George could derive more revenue than they projected from licenses and permits, which they estimated would bring in $754,000. Barrow said the amount of growth in the southeastern part of the parish could lead to those items actually bringing in more money. The interesting thing here is that David Barrow doesn’t really refute the St. George budget study’s numbers. He’s nit-picking at the study’s assumptions because they’re based on population, but that’s hardly a damning criticism. The fact is, St. George’s road density is probably less than East Baton Rouge Parish as a whole, so it might be the actual costs are less than what’s in the estimate. Ditto for drainage ditches. As for the numbers of businesses, there’s a pretty good amount of commercial activity in South Baton Rouge and one would imagine there will be a good bit more coming. There is no reason to think St. George’s occupational license tax revenue would come in short of projections. In other words, to use so risky a source to criticize those numbers in such a weak way seems like a rather feeble bit of advocacy disguised as journalism. As we said, though, Gallo is one of the better reporters the Advocate has, and we wouldn’t accuse her of bias as readily as we would some of the paper’s other scribes. It might just be that Barrow’s history escaped Gallo’s attention when she used him as a source and the whole thing is nothing more than an embarrassing bit of comedy. But the St. George budget numbers are neither bolstered nor debunked by the controversy. Maybe they’re right, maybe they’re not and it really doesn’t matter. The people living in what would be St. George need to decide if they’d rather be governed by their neighbors or by politicians like Sharon Weston Broome at City Hall.